Our products are highly recommended for the smelting, investment casting, electric power factories, oil refineries, glass manufacturers and aluminum production as well as heat treating, forging and welding industries. Due to their toughness, durability and excellent performance our gloves, leggings, sleeves and apron find uses in a multitude of applications from heavy industry to domestic use. Especially for welding machines, rig welding and aluminum welding users, they must use welding gloves as protective equipment and in the equipment for welding they must add welding aprons also as these welding supplies will ensure their safety from heat and molten metal. Our heat resistant gloves and heat proof gloves are protection gloves from many work place hazards. Our product range has been tested in extreme conditions and it’s certified for its level of performance and customer’s total satisfaction. Our customers name our gloves as Kevlar welding gloves due to the material we use, sometimes they call them work glove(s) or welder gloves, welder safety gloves, men’s safety gloves, work gloves, industrial gloves, fire safety gloves, heat safety gloves but in any way they like to call our extreme heat and temperature gloves we name them the hand protection welding range. Our know-how in production of safety products in combination with our industrial designers have created a very ergonomic, solid and strong product range. Our products are made to cover each other so they fully protect the user by offering him a shield of total protection in body with our apron, arms with our sleeves, legs with our gaiters and hands of course with our mittens and gloves. The FireGloves Company holds all the certificates which are needed from the European union protecting all users from extreme heat and fire. Our products (gloves, aprons, leggings, sleeves) are manufactured according to EU standards and under all the rules and directives of the 89/686 EEC of the European Union. The products are designed to protect users from fire, high temperatures and from a limited range of mechanical hazards as well. The EN407 standard specifies the test methods, the general requirements, the thermal performance and the labelling of gloves to protect from heat and fire. It applies to all gloves which must protect hands from heat and/or flames in any one or several of the following forms: fire, contact heat, convective heat, radiating heat, small spray of molten metal or large spray of melting metal. RESISTANCE TO FLAMMABILITY (1 to 4): Time during which the material remains lighted and continues to be consumed after the ignition source has been eliminated. RESISTANCE TO CONTACT HEAT (1 to 4): Temperature (within the range of 100°C to 500°C) at which the person wearing the gloves will not feel any pain (for a period of at least 15 seconds). RESISTANCE TO CONVECTIVE HEAT (1 to 4): Time during which the glove is able to delay the transfer of the heat of a flame. RESISTANCE TO RADIATING HEAT (1 to 4): Time required to raise to a given temperature level. RESISTANCE TO SMALL MELTING METAL SPRAY (1 to 4): Amount of spray required to raise the glove to a certain temperature. 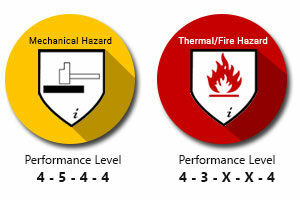 RESISTANCE TO LARGE MELTING METAL SPRAY (1 to 4): Amount of spray required to cause damage. The EN388 standard applies to all types of protective gloves with respect to physical and mechanical aggression from abrasion, cutting from slicing, perforation and tearing. ABRASION RESISTANCE (1 to 4): Number of cycles required to damage the sample at constant speed. RESISTANCE TO CUTTING WITH A BLADE (1 to 5): Number of cycles required to cut the sample at constant speed. RESISTANCE TO TEARING (1 to 4): Maximum force required to tear the sample. RESISTANCE TO PERFORATION (1 to 4): Force required to pierce the sample with a standardized punch. You can follow the links below in order to download or preview our Technical Data and User Guide as well as our product certificates. You can also read a detailed analysis of the most important EN and ISO Standards regarding safety equipment, here.